← Why do people move to North Carolina? In both this blog and recent presentations, I’ve talked a lot about migration, as net migration into North Carolina is a major factor in state total population growth. But this is only one aspect of movement and migration. Each year, many more people move within the state than move into it. In the 2012 American Community Survey, nearly 1.5 million North Carolina residents reported moving in the past year. Of these movers, the vast majority (78% or 1.15 million) moved within the state. Internal migrants’ reasons for moving are distinct from reasons why individuals move to North Carolina from other states and countries. Focusing only on moves that occurred post-recession (2008-2013), Figure 1 uses data from the Current Population Survey (CPS) to compare the main reason for moving by the type of move made. 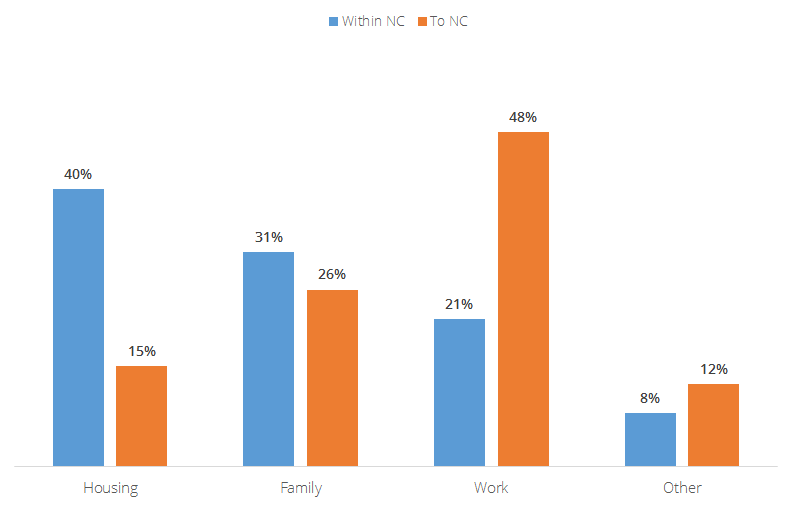 Compared to individuals moving to North Carolina from outside of the state, internal migrants report more moves for housing and family reasons. Within state movers are much less likely to report moving for work-related reasons than out-of-state migrants. Looking at detailed responses reveals that housing quality is a major factor in internal migration; more than a fifth of individuals that moved within North Carolina between 2008 and 2013 reported doing so for new or better housing. Establishing their own household was the second most common reason for moving (12%), followed by a change in marital status (8%) and a desire for cheaper housing (8%). Only 5% of internal migrants moved because of a new job or job transfer; just as many reported moving for an easier commute. What does this mean? Employment is a major force bringing migrants into North Carolina from other states and countries, but it is less relevant to where people ultimately settle within their metropolitan areas and counties. More influential factors are quality and affordability of housing, transportation and commuting, and other community aspects, such as school districts. The relative importance of these factors to individuals, and their availability in a given area, determine internal migration patterns that are strongly influential on population growth and change within the state. Data used in this analysis were drawn from IPUMS-USA and IPUMS-CPS. This entry was posted in Migration and tagged American Community Survey, commuting, Current Population Survey, employment, housing, internal migration, population change, population growth. Bookmark the permalink.